Rachel taking pics from behind us. Emma is too cute not to photograph! Julia in the Orbitron at the Science Museum. Rachel and Ben also rode it. It was neat because since your stomach always stays in the center, you don't get sick. Also, you control how fast it goes or whether you turn upside down by bending your knees or leaning in a certain direction. How fun was this? 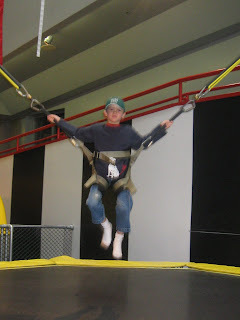 The kids had so much fun on this trampoline, and even Matt couldn't make any cracks about paralyzing accidents or death, because of the bungee cords! 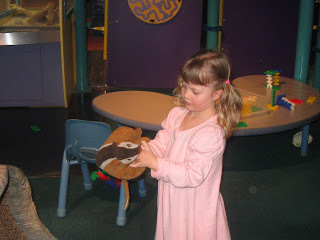 Emma loved these puppets! There was a neat tree stump tunnel/play area where she, Julia and I played for quite a while. 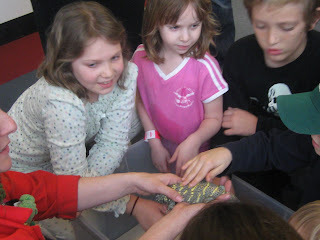 Naturally Julia gravitated to the Lizard Lady! 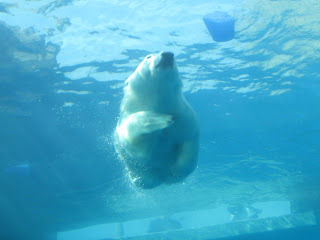 This underwater tunnel to view the polar bears was one of the coolest things I've seen at a zoo. The polar bears loved seeing people in there, too--they would swim down along the tunnel and push off of it to surface--showing off for us, it seemed. This was a huge playground at the zoo. It's much larger than this view. We had to practically drag Julia and Ben from it. They had a pretend game going and had pulled several other children into it. 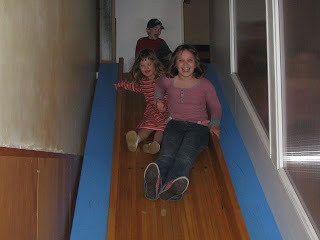 This is the slide at the Children's Museum that had the "too much gravity" room (as Ben called it) at the top of it. Rachel tried to photograph the checkerboard floor and walls so you might get an idea of how bizarre it was--but unfortunately, the picture didn't show the angle of the floor--the checkerboard pattern camouflaged it. The water room was fun. 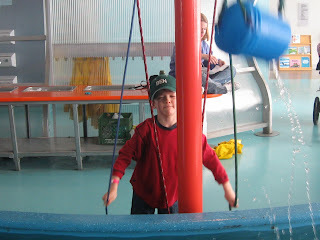 Ben was a bit frustrated by this pulley bucket system--the bucket had holes in the bottom, so the water would pour out before he could move the bucket down the row! Julia, taking the bull by the horns and leading a game--as usual! 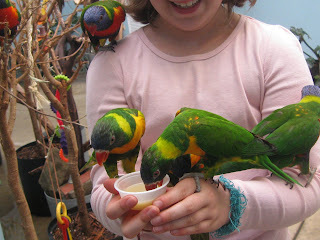 These were the lorries at the aviary--when you got a cup of nectar they flew over immediately, landing all over you. So cute! At first Ben was going to do it, but so many birds trying to land on him freaked him out, so I took the cup instead. Julia was totally in her element, though. If the nectar didn't cost money she could have done this ALL day! This picture is an amazing one by Rachel. The reason it's amazing is that this African starling was on Julia's hand for about 1 second--she and the lady next to her volunteered to hand feed the birds in the tropical rain forest with live worms. 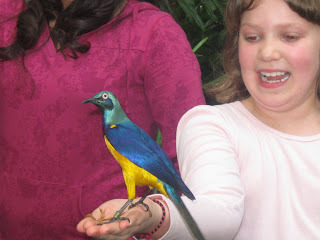 So though the bird looks like it's hanging out, it was really only on Julia's hand for an instant, and Rachel got the photo just in time. A rare sighting of Rachel! In the 200+ photos we have of the trip, she's in perhaps 3 of them. Emma was taking pictures and rachel allowed her to take one when I reassured her that we can delete any bad photos--but lo and behold, Emma got a great one of her smiling big sis! 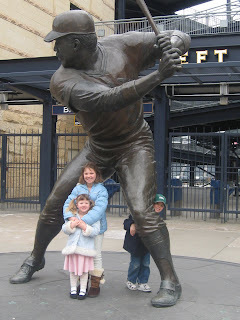 This was the statue of Willie Stargell in front of PNC Park, right next to our hotel. For the life of me, I don't understand why Pittsburgh gets a bad rap. We were there this past week while Matt was at a business conference, and we had a wonderful time and didn't even get to see all we wanted to see. We arrived on Sunday after a very long drive (it took seven hours from my parents' house in Brooklyn, including a stop for lunch and mandatory wild run through the fields to stretch legs and get the kids prepared for the inevitable...it's very hard to tell little kids that no, four hours is not the entire ride, yes, I know you've been sitting forever, but we still aren't there and you'll know we're there when the car stops in front of a hotel and we get out!) We settled into our room at the Marriott Spring Hill Suites, right next to PNC Park, though since baseball season doesn't begin till April 19, it was an empty, quiet PNC Park! The kids, as usual, wanted to explore every nook and cranny of the room, including closets, bathroom and drawers, the location of the ice machine, and were thrilled by the kitchenette (as I was...theoretically at least, it meant we could have some meals in the room, though this only happened for a late lunch one day, as well as snacks, of course. The hotel offered a primo breakfast buffet, including eggs, waffles, sausage and bacon, cereal, oatmeal and toppings, fruit, yogurt, bagels and english muffins, and various pastries, donuts, and muffins. Coffee, juices, milk (and Emma's adored chocolate milk in tiny cartons with a straw? What could be nicer for a 4-year-old?) and tea--we ate a huge breakfast every day and then got by with a small, late lunch. The other wonderful thing about the hotel was the shuttle bus service...they would drive you anywhere in the main area of the city, and pick you up when you were finished. I have never been to a hotel that offered this perk--airport shuttle? Sure. But not door-to-door service for restaurants and museums! And the kids absolutely loved riding in the bus...no car seats! Ben and Emma hardly knew what to do with themselves, but they loved the freedom. * The pool. As usual, the kids love swimming, and they love it even more when it seems like they're getting something for nothing--in this case, swimming inside when the weather outside wouldn't permit it! Personally, I hate indoor pools, as the smell of chlorine is overwhelming, the acoustics of four children in an indoor swimming pool is unbearable, and though I enjoy the pool, I really only enjoy it when I'm hot. So hotel pools are not my favorite thing, but since it was for the kids I have included it. * The weather. We had superlative weather. Our two travel days (last Sunday and last Friday) were chilly, but we didn't care since we were trapped in the car anyway. Our first full day, Monday, was pretty seasonable, in the low to mid-50s and cloudy. However, Tuesday and Wednesday were gorgeous spring days, in the 60s and even reaching into the lower 70s on Wednesday. 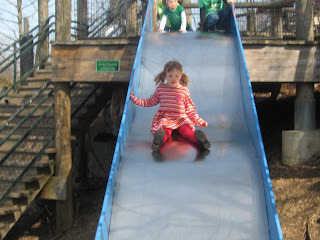 We mostly scrapped the bus service and walked to all the attractions, and found a playground on the way back to the hotel on Thursday for some much-needed outside play. We were disappointed when we checked the weather report on Wednesday night, which said Thursday would be rainy and have a high temperature of 47...what a disappointment for our last full day! Imagine our surprise at the bright blue skies, sunshine, and 65* weather we actually got! 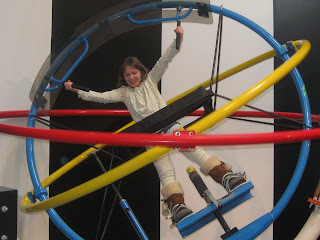 * The Carnegie Science Center. We got in free with our Boston Museum of Science membership. 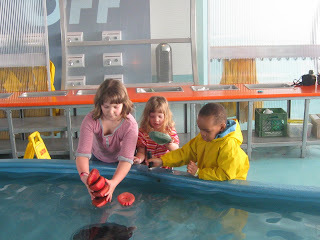 There was water play, trampoline play, a ride which simulated a trip down the Amazon, an Imax movie on life under the sea (complete with popcorn! ), a show about the chemistry of making fruit flambe (complete with a taste over vanilla ice cream...), a gigantic train set showing Pittsburgh of about a hundred years ago, complete with 4 seasons and even day and night, a kid zone with puppets, playground, working farm, and a bucket and pulley system with balls that shot out of cannons and everything. Much fun was had. 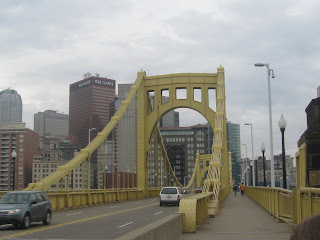 * The Pittsburgh Zoo and PPG Aquarium. This was my favorite day by far. I love a good zoo, and this was a good zoo! (Though I did regret it was early in the season, as some animals were not on display till April, and the rides weren't running either. Still, the cooler temperatures made the animals that were there very active and playful.) We saw a snow leopard, lions, togers, polar bears and regular bears, otters, giraffes, zebras, monkeys and gorillas, kangaroos, elephants (including a baby that was oh-so-cute), birds of all kinds....they had a super playground with nets to climb and bounce around in, slides and decks and steps. It was a gorgeous day to be outside, and we thoroughly enjoyed ourselves. * The Pittsburgh Children's Museum. I felt a bit bad for Rachel, who was too old to have a whole lot of fun here and spent most of her time with me, watching the kids and chatting. But for the other three kids, this place was a blast. They had a room that mimicked Mr. Roger's Neighborhood (whose show they unfortunately detest, but when it's laid out in front of them is a terrific play place!) 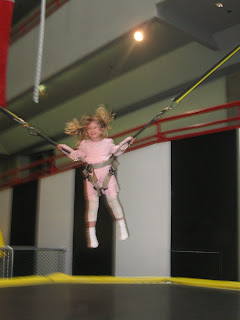 , a three level climbing area of carpeted ramps and little rooms, a treehouse room complete with nest-building materials and giant robin eggs to play with and a hut shaped like an acorn, and a room called the garage, which had an atrium ceiling to fit in a huge play structure that has a pulley system to launch parachutes to the ground. It also had a pulley structure using balls which travelled along wires and through baskets to eventually drop back into the start where you could send them up again and watch them travel the room endlessly. The prize for bizarre went to the Animateering Room, where the kids could use a video-game-like machine to make a puppet show, there was a room you could go into and stand next to a mannequin, and through camera tricks, people outside the room could see you as a ghost, and a huge slide down the side of the room, which looked innocuous till you went to the top and found that there was a room you had to walk through to reach the slide whose floor was tilted at a 25* angle and had a checkerboard floor and walls--the combination of these two things jarred the brain so much that I was dizzy and had to hold the walls to make it across the room without falling. The kids loved it, though. * The National Aviary. 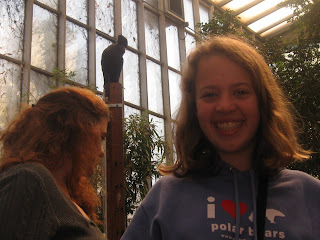 Julia loves birds. We all do, but she especially does, and so this beat out the Natural History Museum as our last attraction of the week. 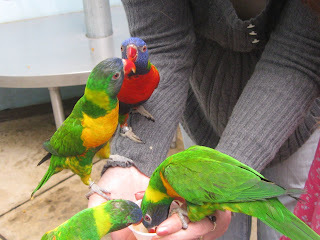 We got to feed lorries, little parrots from Australia who are very curious and friendly and flocked all over us when they saw the much-loved cups of nectar in our hands. We saw a show about how different birds fly and what they eat--including a Eurasian eagle-owl named X, a crow who would stow dollar bills in a collection box, a toucan who landed on shoulders, and gulls who snapped food out of the air. We toured a tropical rain forest and the kids got to hand-feed birds there, from African starlings (who are bright and gorgeous like parrots, unlike our own European starlings, who are just pests) to blue crested pigeons, who look like blue peacocks with delicate crowns of feathers on their heads. We went to a presentation on veterinary care and learned that birds stop breathing when anesthestized, and fed a tiny duck named Milo who is one of their biggest veterniary problems at the aviary (she often has trouble laying her eggs and has to be treated to get them out...) We ended up at the wetlands exhibit, where we were transfixed by the flamingoes, roseate spoonbills, and scarlet ibises. It was really a lot of fun. All in all, it was a terrific vacation, as much fun as Boston but with the added attraction of everything being new to us. We are happy to be home now, with our own beds, the kids' toys, clothes in closets and drawers instead of in suitcases, outside to run wild in at a whim (that is the worst part of hotel life with kids, in my opinion--the inability to have space to do what they want!) and perhaps most of all, a break from restaurant food! Though we all love eating out, after a few days it just becomes too much. Not enough vegetables for the kids is the biggest difference, though Rachel did order a huge salad for dinner one night and the kids all had some--restaurant kid meals are truly terrible in terms of the old 5-a- day! Luckily we had fruit at breakfast and in the room, and I also bought a bag of baby carrots they devoured. I will post some photos later today. I have to sort through them and decide, as Rachel took so many pictures of animals and scenery. This post has taken a while and the kids are clamoring for attention! No, We Haven't Dropped off the Planet--We're On Vacation! I had every intention of blogging on our vacation--we're in Pittsburgh, tagging along on a business trip with Matt (much like when we go to Boston in November). We are having lots of fun. Despite everyone always ridiculing Pittsburgh, we are finding it a lovely city with lots to do, and we are having gorgeous weather to boot. However, our hotel offers a wonderful breakfast buffet that is only open till 9:30, which means we have to get moving early (for us!) and so I haven't had the time or energy to blog at midnight the way I did from Boston. Also, we've taken photos and those can't go up till we're home anyway...so I'm using that as another excuse! We return on Saturday and I will try to post over the weekend, amidst grocery shopping, unpacking and laundry. Have a great week! P.S. Note to self: Change photos on blog cover to reflect SPRING!!! Ben loves math. That's all there is to say. He has finished his 1st grade math curriculum--finished it quite some time ago, in fact. When I bought the fat Brainquest 2nd Grade workbook back at Thanksgiving, thinking it would cover any gaps for the rest of the year while actually providing a challenge, I thought it would be especially nice for Ben to go up a notch in math--everything covered for first graders is easily completed by Emma, except for the actual forming of numbers, which she still has some problems with. She can do everything orally, though. Well, the 2nd grade math in that workbook wasn't much of a challenge for him, either. So now we are getting to the creative portion of the school year. This is not as much of a problem for the girls because their work generally lasts through at least May. This is because for a given subject, say Language Arts, I get many different components--there may be workbooks on spelling, grammar, reading comprehension, then there are novels for reading and different reports or journals to write. This spreads the work out across the year. 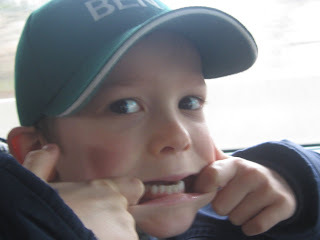 However, for the younger grades I tend to rely more on multi-subject workbooks because first of all, at this age Ben just doesn't need to sit all day for school work, and second of all, this way we get an overview and can then focus on things he really enjoys. He is still making pages for his history notebook, doing the Draw Write Now books, and playing his music CD-Rom. For science, we have been doing some books my mom gave him at Christmas time, which are a bit above his level I think but he seems to like the activities (lots of crossword puzzles, scrambled word puzzles, secret codes and things of that sort) and if I help him he does fine. For math I have started writing problems for him to solve. He loves doing addition and subtraction with as many digits as you want to throw at him--he loves carrying and borrowing. He's like a little accountant, scrabbling away at math problems, and I often get up in the morning and find that he has written out a page on his own and solved them all. And he rarely makes a mistake. We have been practicing spelling using a Leap Frog game meant for Grades 1-2, which is kind of funny because he seems to know almost every word in this game--but no matter how many times I remind him he insists on spelling "were" W-H-E-R and mistakes of that nature. And then of course we play chess and checkers and Battleship and cards, and he has been loving the finger knitting and he reads, draws and writes his own stories. Looks like his school year will be wrapped up in May! 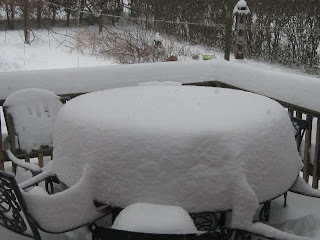 This is of the back patio, and is not even representative of all the snow we had--it continued to snow throughout the day! 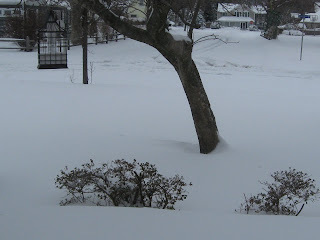 This is from the front patio, and those azaleas are buried almost to the top with snow. 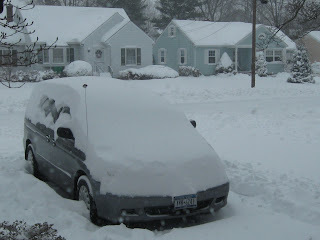 The next one is of the car in the driveway and the street behind it--notice the road is unplowed. I was totally taken aback by that, as the plows are usually out in full force the night before a "storm" where we're only going to get a few inches! I guess they decided to conserve gas or something?? It always seems like the best snow falls in March. We have had a very snowy winter here on the East End. I remember we had a great one on December 19 (because it was our anniversary and it spoiled our plans to walk to the restaurant we went to for dinner!) and we pretty much had snow on the ground continuously till Valentine's Day, which is unheard of here. We had more snow this winter than probably the part four years combined. Then there were a few spring-like days, and March was coming upon us, and thoughts turned to sunshine and flowers...but too soon. This past weekend the weathermen were talking of nothing but snow. Don't get me wrong, I believed we'd have some snow, but I was not prepared for what we actually got! My family has been sick (for us) for the past week or more. I say "for us," because we don't get sick often, and when we do, it generally is not as bad as what everyone else seems to get. Friends have been plagued with illnesses ranging from colds to flu to pneumonia this winter, so our colds are not bad in the grand scheme of things. 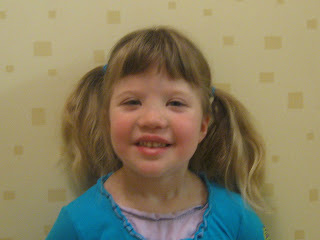 But first Julia had a cold, then Ben (with a 4 hour fever), then Emma and then I finally succumbed late last week. Matt and Rachel, as usual, went unscathed. My cold was odd because I had it for two days and then began to feel better, so much so that I went to the gym on Saturday night. Then on Sunday afternoon I felt queasy, and felt worse and worse as the evening wore on. The snow began around 7pm and was very heavy by the time I went to bed. I had a rough night, and Matt knew his office was closed before we even went to bed, so I slept till 10 without worrying about it....and woke up to a foot of snow! The day went on, and I was sorry to miss it. The kids played, Rachel and Julia shoveled, and I...was sick. I had a fever, a blinding headache, and ended up sleeping a great deal. By the time I was a bit coherent in the late afternoon, we had nearly 18 inches of snow...they are saying more snow than we've had here in 20 years! I really regret that we have not gone sledding this winter--I got so used to our winters being comprised of four or five tiny snows that melt in a day or two that we haven't gone sledding since Rachel was 6 or 7 years old--and this would have been a perfect snow to head to the public golf course and gone down the hills with the kids. Unfortunately, I was not willing to freeze to death while sick in order to do it, and though I am on the mend today I have a feeling that by the time I feel up to it, the warming trend is going to have melted it all. I have to keep sledding in mind for next year! Will post snow photos later!